Napoli are the Marmite of Italy. You either love them or you hate them. Having seen them twice myself, I've got a foot in the camp of the former. Their fans can be both mesmerising and frightening at the same time. If you go and see Napoli, you won't forget about it in a hurry I can assure you. This is the first of a two-part look at the club. Firstly, we'll take a look at the fans and try and get an insight into their world. Later in the week, I'll try and give you a rough guide should you ever want to go and see a game in the Stadio San Paolo. As always here at EFW, we'll start with the fans. I interviewed lifelong fan Fabiano from Naples this week. He told me his love for Napoli, both the city and the team is something that cannot be described with just words. To Fabiano, Napoli are not just a team, they are his life and that rings true for many Napoli fans. 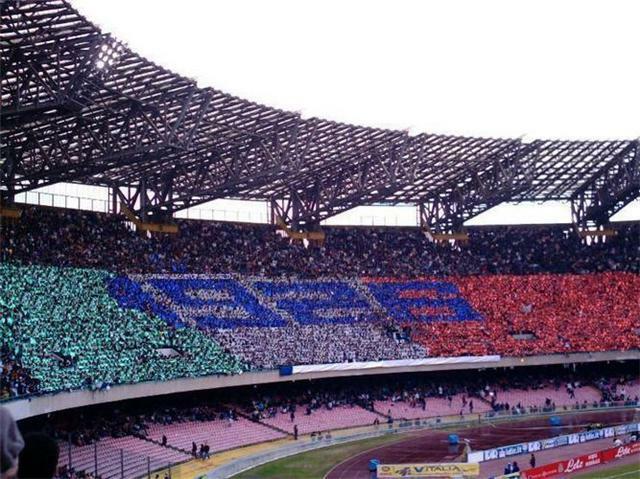 Do you think Napoli have the best fans in Italy? I do think we are Italy's best fans, because no one is as passionate as us: there are people who would rather skip their lunch than miss the match. Roma have passionate fans too, but they're not in the same league as us. When Napoli play away, the guest stand is always packed with every seat taken. Tickets run out very quickly. Furthermore, we never stop singing till the end of the match, even if we're losing 0-10!!! In conclusion, Napoli are a religion, not a team, to us. Is there a sinister element to the Napoli support? There is a sinister element to our support, because since the 'Ultras' want everybody to sing, sometimes you can get in trouble if you don't sing, but not in deep trouble: they might just shout at you. But this happens just in the Curvas, where the Ultras stand. Talking about other fans, we are brothers just with 4 teams: Genoa, Ancona, Palermo and Catania, apart from those who come from the province of Naples. All the other teams are enemies, and our toughest feuds are with Roma, Lazio, Verona, Atalanta, Juventus, AC Milan, Inter Milan. Some other firms hate us, like for example Cagliari, Bari, Salernitana and Avellino, but these feuds are not as tough as the ones I mentioned before. The one with Roma is the toughest rivalry in Italy, because it's just a football matter, not a social one like the rivalries with northern teams, so all the hatred is concentrated in football. Furthermore, Napoli and Roma are the 2 toughest firms, so when we meet up problems always occur. Nowadays it is impossible for us to go to Roma or for them to come here, because since a police officer was killed in Catania 3 years ago, many new rules have been made and many things have changed: when there's a high risk match, away fans are forbidden to go, and tickets are ordered to be sold only within the province of the city where the match is supposed to be played. Italian football association (FIGC, Federazione Italiana Giuoco Calcio) are trying to solve this problem with the 'Tessera del Tifoso', a card that will allow away fans to go to the ground even when forbidden. But you must not have had criminal records concerning football in the last 5 years to get it, so Ultras totally disagree with buying one. How many ultra groups do you have and do they all get on with each other? We have 2 Curvas: Curva A and Curva B. In Curva A there are many groups, each one with his leader, and they seem to get with each other since they allsing at the same time. The most famous groups are: Mastiffs, Teste Matte, Vecchi Lions and Brigata Carolina. Curva A is the one with the toughest fans. Curva B have just 2 groups: Ultras Napoli and Fedayn, and they don't get with each other: when Fedayn sing, Ultras Napoli remain silent, and viceversa. Curva B used once to be the best firm in Italy (Curva A and B, our 2 firms, get their name from the end's they occupy), but it has recently slowly come down, since there's not a real leader now. They once used to sing all match long, but nowadays the ones who sing the most are Curva A's groups. Is it safe to watch a match at the Stadio San Paolo? 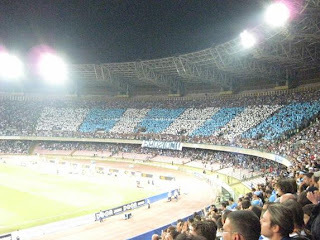 Watching a match at San Paolo is safe, but it depends what stand you go to: I would not advice you to get a ticket for the curva, but Distinti, Tribuna Nisida and Tribuna Posillipo are quiet. Distinti are a bit more noisy, but Tribuna Posillipo is very quiet because it's attended by rich people, old people, fathers with their kids and journalists. But it's the most expensive stand of the ground, so I advice you to go to the Tribuna Nisida, which is quiet as well. What is the stadium like and are there plans afoot to renovate it? The stadium is like a giant egg, and there are plans to renovate it: athletics track, roof and 3rd ring (the upper part, which is shut because it could fall) will be torn down, and seats will be built closer to the pitch. Click to enlarge the Stadio San Paolo. Are away fans always allowed into the stadium for every match? Away fans are not always allowed to come to Napoli, but if we play against a team we are brothers with or which is not much of a feud to us, then they let them come. Who are your rivals? Our rivals are mainly in Northern Italy, because there's a high social disagreement between north and south, and this is reflected in football too. We are rivals also with Roma and Lazio as I told you before, but it's just a football matter, it's a social one. 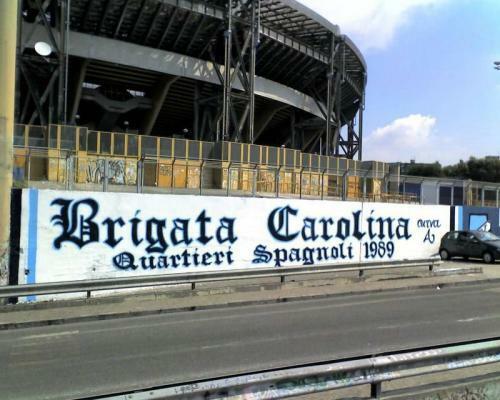 Furthermore, there are some teams in the south we are rivals with because of things that happened many years ago, because they are brothers with a team we're rival with or because they come from the same region as us: Cagliari (we had a riot with them in 1997), Bari (they're brothers with Salernitana, our enemy) and Salernitana (they're in the same region as us, Campania, but it's not much of a rivalry to us, because we have history unlike them, although they feel this feud a lot). Are Napoli fans always allowed to travel to away games or are there still bans in place? Napoli fans are almost never allowed into the ground when they're guests, but sometimes we manage to beat the system by buying tickets for other stands (guest stand is shut) or turning up the very day of the match and forcing police to let us in to avoid deeper trouble. Were you on that infamous train that went to Roma on the opening day of the season in 2008? No, unfortunately I was not on that train, but a friend of mine was there and told me it was all fixed up, because they didn't do anything bad apart from lighting some torches and firecrackers, so banning us from away matches for all the season was a too severe punishment, and totally stupid as was the decision of shutting our curvas for 3 matches (we won them all, nuts to them!!). In the previous days, Trenitalia, the Italian train company, had refused to give us a special train to go there, so we had to travel on an Inter City after waiting for several hours at the station. They said we ripped out seats, broke windows and toilets, but it's not true, because 2 Austrian journalists were on that train and said that nothing had happened. They just showed 4 broken wagons, the others kept on travelling across Italy. When we got to Rome, we got on buses, and they said we destroyed them, but not that each bus contained 150 people. They said we tore down the ground's gates, but when we got there they were already open, and no one was there 2 check us up. Because of decisions like that, Napoli fans do not like Italy at all: I mean, why would we support a country that hates us?? Does the shadow of Maradonna still loom large over the city? Yes, Maradona is still God to us, because he took us to win 2 leagues and the UEFA Cup, something we had never experienced before. We adore him especially because he used to play for the people, not for money. Have you been to see Napoli? Got a story to tell? read that every time that maradona stops in italy the police take something belonging to him to pay back some of the huge tax bill he still owes the state. @Mark W - That's a great story! Seen Napoli play 4 times including as a 7 year old watching Maradona. A great place to watch football. The stadium like the city itself is choatic and not always beautiful but the passion is intoxicating. I've been in the curva every time and had no problems at all. Real shame they have slipped up of late so will miss out on Champions League - would have been great to see them at the top table. When is the second part out?